This article describes a tree project undertaken by a class of 5- to 7-year-old children in the Child Study Centre at the University of Alberta. Following a description of the school and the children, the article discusses how the project evolved and discusses the three phases of the project. Photographs taken during the project are included. The Child Study Centre of the University of Alberta is located in Garneau Elementary School just blocks away from the campus. 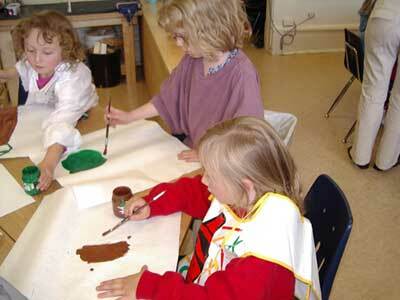 The Child Study Centre is a laboratory school administered by the Department of Elementary Education of the University of Alberta. It provides opportunities for teacher education and research. The centre is considered an alternative program operated by Edmonton Public Schools in partnership with the University. 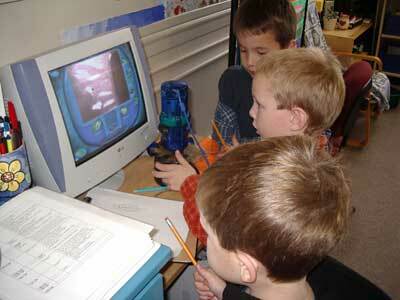 The Project Approach is used in all Child Study Centre classrooms. Each class is staffed by a full-time teacher and a teaching partner to facilitate many visitors who spend time at the centre. There is a generous amount of parent support. The children come from all parts of the city and are driven to school. 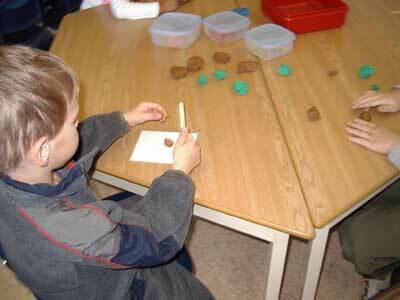 The centre models integration of children with special needs in each class. 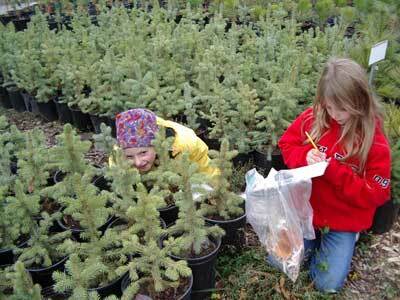 The Tree Project was conducted by children ages 5 to 7. It took place in September and was the first project of the school year. 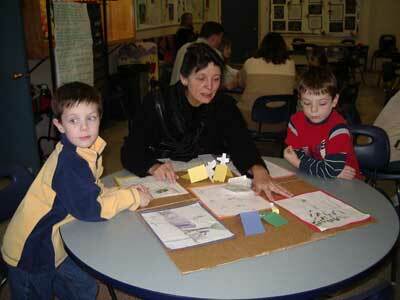 Many of the children had previous experience with project work by attending the centre kindergarten. This was the teacher's second year teaching this age group using the Project Approach. The teachers spent an afternoon planning what the project could look like. 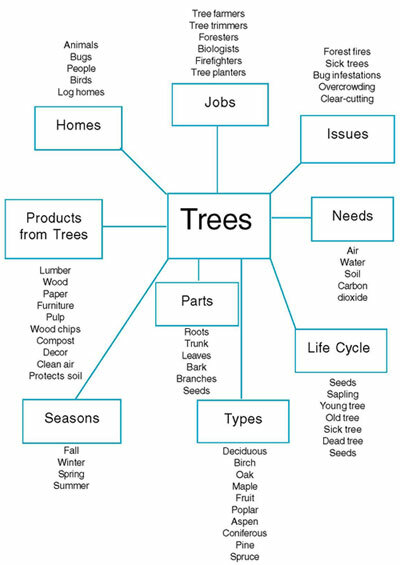 The teacher and teaching partner made a topic web to generate ideas about the tree project (as shown in Figure 1). This process brought the teachers together so they could guide the project. As a part of this process, they discussed what resources would be required, and they created a list of items that they wanted parents to bring, a list of experts who could come into the classroom, and a list of possible field visits. Phase 1 was planned before the children began talking about the project. Figure 1. Planning web of the Tree Project created by the teachers. In addition to creating the planning web, the teachers charted what Phase 1 would look like for the children (Figure 2). Children document what they know about the topic. Children express what they know about the topic through a variety of media. Children plan how they will seek answers to their questions. Children's work is displayed to show each other what knowledge they have in common. Start with story about trees. "I have seen trees and I noticed how they are changing." Discussions about what they know about trees. Create a web of all the things they know about the trees, large class web with picture cards they put up. Form questions about what they want to know about the trees. 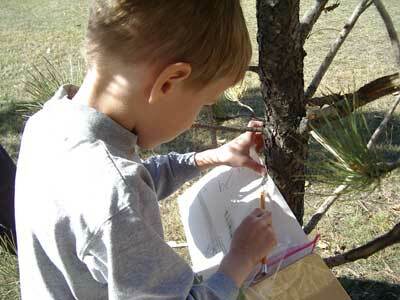 Children create labeled drawings from memory about what they know about the trees. Children paint pictures of what they know about the trees. 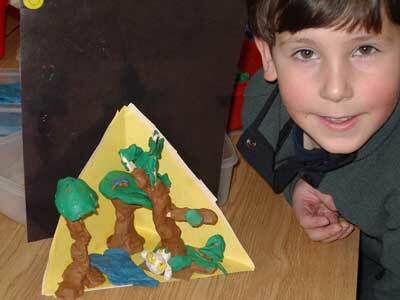 Children create plasticine models of trees. 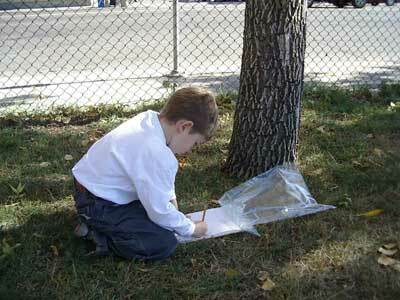 Children draw pictures of what they know about trees. 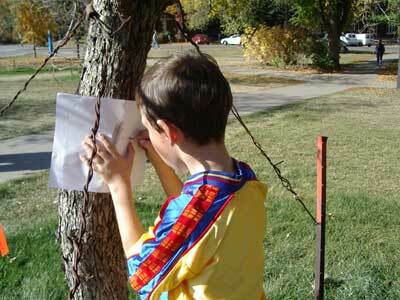 Children make lists of things they know about trees. Children make pictures from ripped paper of trees. 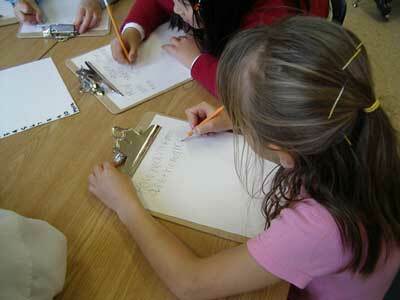 Through journal writing, children document their questions and plan how they will be answered. 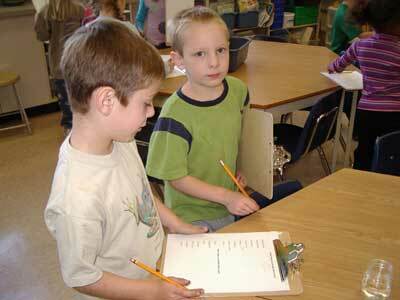 Children ask each other questions through surveys. Children share their representations. 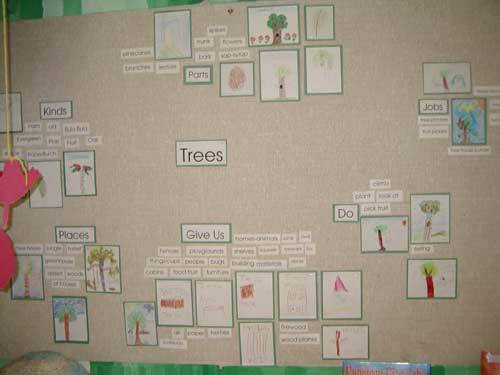 Outside bulletin board is changed at this time to show the children what they know about trees. Figure 2. Chart of Phase 1 of the Tree Project created by the teachers. The letter also asked that parents dress their child in appropriate clothing for being outside. The parents brought in all of the items, provided the teachers with the names of people who could come talk to the class, and supervised field visits. Through the weekly newsletters, the teachers updated parents on how the project was progressing and suggested how they could encourage their children's involvement in the project during each phase. Parents were given questions that they could ask their children and conversation starters such as "I wonder how many trees are in our backyard?" The teachers began the project by gathering the children in a circle on a carpet. To get the discussion started, the teacher told a story about how she had noticed that the roots of a tree were pushing up the sidewalk. The teacher carefully considered which story to tell the children because she knew that the details could steer the discussion in a particular direction. Each child was given an opportunity to tell a story, a fact, or anything that he or she could think of that related to trees. The children were also given the option of not participating in the discussion if they could not think of anything. The teachers transcribed the children's stories. The children's stories and ideas gave the teachers a baseline of information on the basis of which they would evaluate the children's progress at the end of the project. The children were very good at expressing their ideas, but they had a hard time listening. As soon as the teacher noticed that the children were becoming restless, she moved the discussion groups to the tables where the children could represent what they knew about trees in various media. Those who did not get an opportunity to tell a story were able to express what they knew through drawing, discussing the topic with their peers, or building models. While on the carpet, one boy told the class his story, "My mom has two trees by our garage that she wants to replant in the front yard because they are too crowded." Another child said, "I saw a tree being dug up by a bobcat at my brother's school." A little girl remembered, "I picked apples from my grandma's apple tree." Another boy expressed that he, like the teacher, had seen a tree's roots popping up out of the sidewalk. The child told a joke, "What is a tree's favorite drink? Root beer!" One boy told the class a personal story that evoked many questions. His story was about a boy who wanted cedar plank salmon. He asked his mother if he could have one. His mother bought a salmon, put it on a cedar plank with lemons and spices, and then cooked it. The boy loved cedar plank salmon. After his story, the children asked, "What is a cedar plank?" "Why do you put salmon on it?" The boy was able to tell the children that cedar is a type of tree and that you cook salmon on it to make it taste good. By allowing the children to tell their stories, the teachers were able to find out many interesting things about trees. While at the tables, the children painted, drew pictures, built things in the block center, and continued to talk about trees. 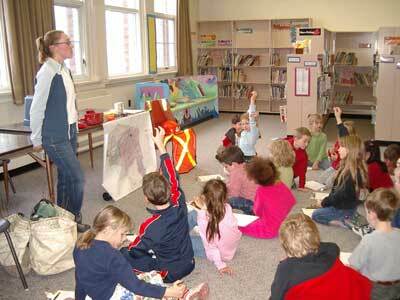 The teachers circulated around the room to probe the children about what they knew about trees. The children's discussions were documented by the teachers. At the block center, several boys were building things. One boy was not interested in the topic of trees. He was building "The Chamber of Secrets" from the Harry Potter movie he had seen. The teacher asked him what he knew about trees. He said that he did not know anything about trees and showed all the signs of not wanting to engage in the topic. His friend said that the Chamber of Secrets was from Harry Potter. I asked if Harry Potter knew anything about trees. He got very excited and said that Harry Potter had got stuck in a tree called the "Whomping Willow." The boys proceeded to make the Whomping Willow out of blocks and began talking about what parts of the tree they would need to make first. Figure 5. 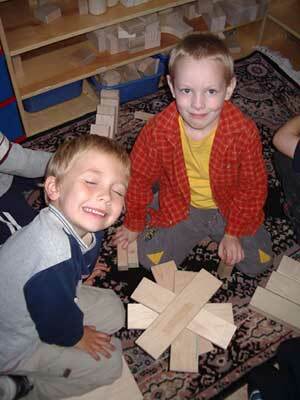 Children building with blocks. The next day, the class gathered on the carpet to participate in creating a web on the topic of trees. The children were asked to call out any word that came to mind when thinking of trees. They called out words about the parts of the trees, things that were made of trees, how trees were important, and kinds of trees. The teachers wrote down the children's words and then helped the children create categories. Some children chose one of the words, drew a picture of it, and placed it in the correct category on the board. In the end, the children had created a descriptive web that was displayed in the classroom. Figure 6. The topic web created by the children. Figure 7. Children drawing pictures for the topic web. The children went to the tables to tell the teachers more about what they knew about trees. They drew pictures of the words from the web and conducted surveys on "How many trees do you think are on the playground?" The children loved drawing pictures. One child remembered that she had done a project on life cycles in kindergarten and drew the life cycle of a tree. Figure 8. Children surveying each other. Figure 9. Children surveying each other. Where do trees get their leaves? Where do trees get seeds? How does a seed turn into a tree? How do you make a cedar plank? How do apple seeds make apples? How do you get apples? How do trees make pinecones? How come some trees have leaves in winter and some don't? Why do leaves need to change color in the fall? How do trees give us love? How do people make houses out of trees? Why do trees give us air? Do trees die in winter and wake up, or do they live a long time? How do trees take water up into their roots? The children sought answers to these questions when they went out on field visits. The first visit was into the schoolyard to look at trees. Before the visit, the children took clipboards and a plastic bag to collect leaves and any items that had fallen from the trees. The children were asked to write a word or a question on their clipboards that would help them remember what they were going to look for while they were outside. While outside, the children spent time drawing pictures of trees, taking rubbings of bark and leaves, and drawing some of the playground equipment that they thought might be made from trees. The children collected seeds, leaves, and twigs that had fallen on the ground. Figures 10-12. Children taking notes of the trees in the schoolyard. When they returned to the classroom, the children were encouraged to look through their bag of collected items to show what they had found. To help the children sort through their bags, the teachers set up activities such as sorting the leaves by shapes on a table, arranging the leaves by color on a chart, looking in books to identify the types of leaves, and looking at their specimens under a microscope so that they could take a closer look. Figure 13. Children looking at leaves under a microscope. 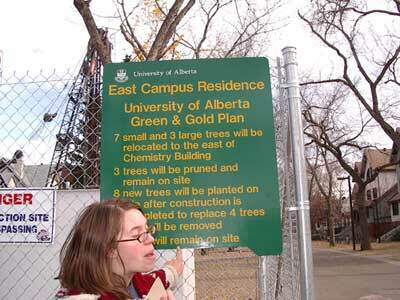 Our next visit was to the University of Alberta campus. The teachers investigated what kinds of trees they might find on campus by looking at the University Web site (http://www.ualberta.ca/ualberta/Alumni/trees/tour1.html).The children were encouraged to write down what they wanted to observe or investigate while on this visit. The children gathered on the carpet and told the teachers some things that they could do while on the visit. 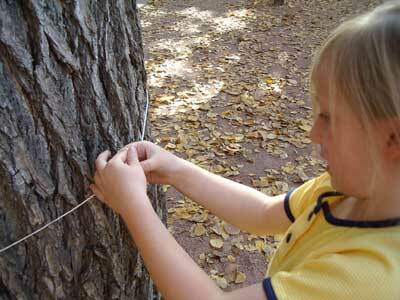 One child suggested measuring trees with string, which we had been doing in our math centers. Some children wanted to look for sick trees; others wanted to find animals or bugs that lived in trees. Some children wanted to count tall trees. 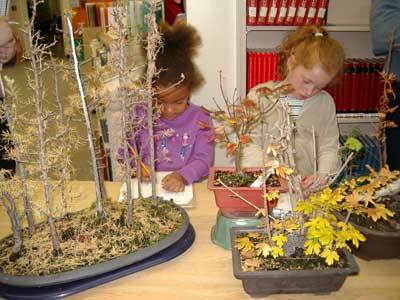 The teacher modeled that she would be looking for trees that had needles and trees that had leaves. Once their clipboards were prepared, the children walked several blocks to the University campus. The children were encouraged to look at the trees that they saw on campus. One child noticed a bird's nest in a tree. 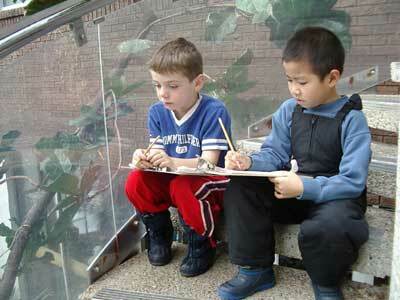 Those children who were looking for animals were encouraged to draw their observations. The other children collected leaves, pinecones, or seeds. 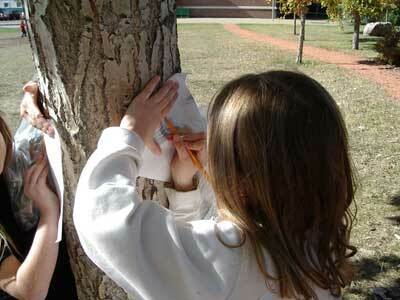 Once the children arrived on campus, they quickly became busy with investigating the trees around them. The teacher modeled making observational drawings for the children and following through with the plans that they had made before leaving. On the way back from campus, the teacher read a sign to the children about trees that had been removed and relocated from the site so that housing could be built on that site. Figure 14. Children measuring with string. Figure 15. A teacher reading a sign. Figure 16. Children looking for sick trees. The children returned to the University campus a few days later once the leaves had started to change color and fall to the ground. The children were encouraged to make observations of the changes that had occurred. 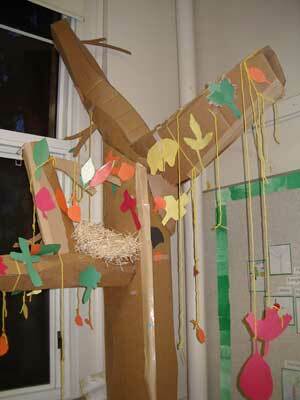 The children noticed that they could see the bird's nest more clearly because many of the leaves had fallen. They discussed whether or not the bird still lived in the nest and what kind of bird it might be. When the children returned to the classroom, they were given opportunities to represent what they had seen by making models, movie strips, or books. A group of children worked with the teacher to set up an experiment to find out what kind of soil trees grew in. They went around the schoolyard and collected various types of soil to plant seeds in. The children took sand from the playground, red clay from the paths, gravel from the parking lot, and soil that we had in the classroom. They planted grass seed, maple seeds, and chestnut seeds in clear plastic cups and labeled them. The children drew a picture of how they had set up their experiment. Throughout the project, the children enjoyed checking to see how things were growing. Other children made models of the nest that the class had seen, while another group of children worked on making books about the trees. Another group of children had been talking about the various colors of the leaves, so they worked on extracting the color from leaves by grinding and pressing the leaves onto paper. Figure 17. 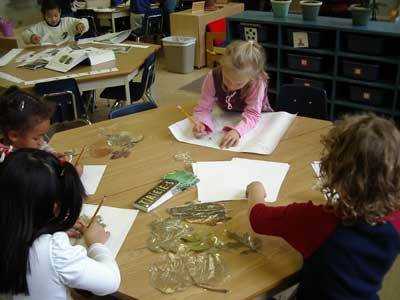 Children working with leaves. Our next visit was to a tree farm. 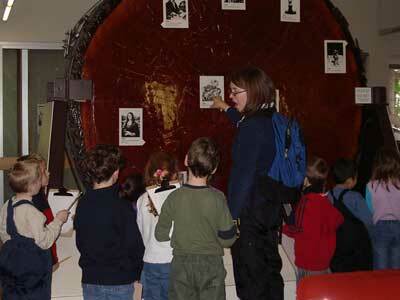 The children again prepared questions for the visit and planned what kinds of questions they wanted to investigate. The owner took the children around and showed them how to identify the trees on her land. The children were very interested in a huge pile of tree stumps. The children sat and studied the tree stumps; they counted the rings to find out how old the trees were when the trees had been cut down, and they studied how the stumps were piled. They asked lots of questions about where the trees had come from and why the trees had been cut down. 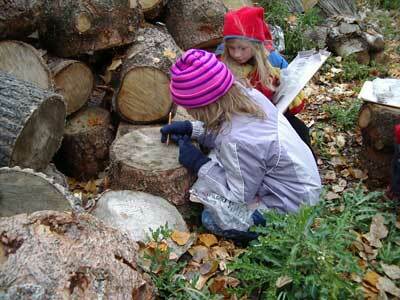 The teachers were surprised by the amount of time the children wanted to spend investigating the wood pile. Figure 18. Children counting rings on trees. The children were given lots of time to explore, draw, and ask questions. 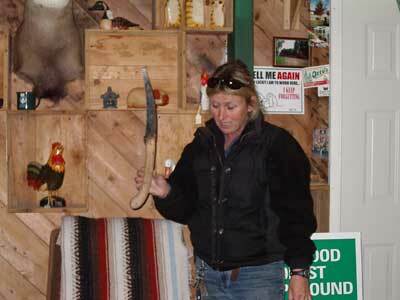 They returned to the barn and had a chance to see the tools that are used to prune and cut down trees. 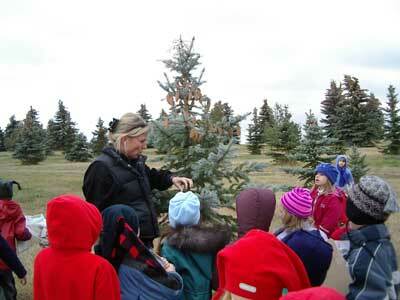 They went to the tree yards and saw the various stages of the growth of trees. The owner showed how the saplings are covered with sawdust to insulate them from the cold winters. The children saw trees that were the same age as they were. The children felt very proud that they were taller. They were able to see what helps and hinders trees from growing, such as the amount of sunlight the trees get, the temperature, the wind, the amount of moisture, and any diseases that may affect the tree. Figure 19. Children looking at saplings. Figure 20. An expert showing tools to the children. Figure 21. An expert explaining how trees are affected by weather. The next visit was to look at trees that are found in other climates. The children went to look at trees in a conservatory. It was here that they saw trees that are found in deserts, rain forests, and temperate climates. They were able to continue identifying trees, and they classified trees by where the trees grew. They were able to see trees that they had not yet seen in the local surroundings. 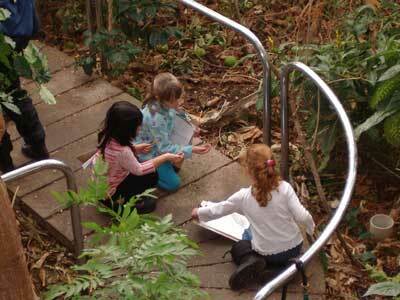 The children were encouraged to use their senses to explore the trees. The children took rubbings to document the textures. They were able to smell the leaves, taste the fruit, and listen to the birds that lived in the trees. Figure 22. Children looking at seeds that had fallen from the trees. Figure 23. Boys making observational drawings of birds that live in trees. Figure 24. Teacher reading information about a very old tree. Experts came to the classroom. 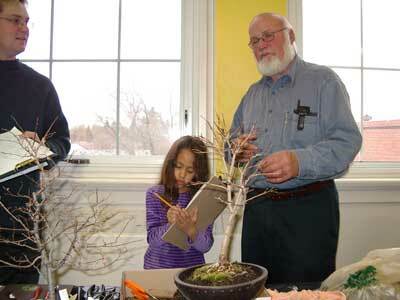 A man from the community came and showed the children how he grows and cares for bonsai trees. The children were very interested in seeing how trees were kept from getting big. The expert demonstrated pruning techniques and showed the children how to wire the trees to keep them from growing. Figure 25. 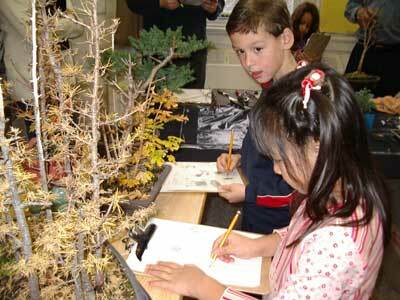 Children making notes about bonsai trees. Figure 26. Talking to an expert about how to make trees small. Figure 27. Comparing bonsai trees. Our next expert worked as a forest technologist, and she talked to the children about clear-cuttingtaking large areas and clearing all the trees away. She was able to answer some of the children's questions about where all the wood we use for various things comes from. The children were very interested in the equipment that she used to measure how many trees are in an area. She talked about the safety precautions that she must take to do her job. The children tried on her safety equipment. Figure 28. Forest technologist talking about how she uses maps to do her job. Figure 29. 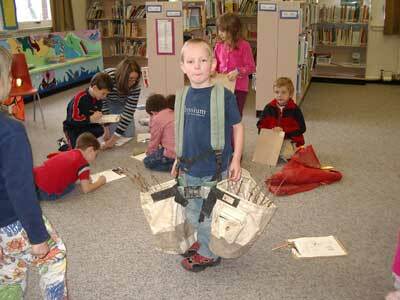 Child wearing tree planting bags. Now that the children had experiences and knowledge from their field visits, the teachers wanted them to represent what they had seen and learned. The teachers gave them several choices and set the expectations for what they wanted to see in the children's representations. The children could choose from making a model, a game, a book, or a map of one of the areas that we had visited. The children had to draw a plan of what their representation was going to look like, and the teachers asked them to make a list of what they needed. 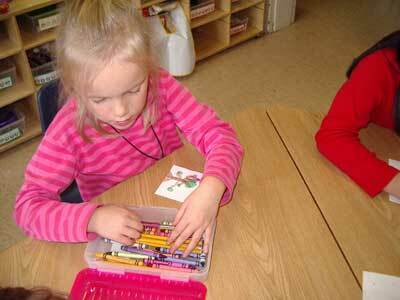 Some children were able to get started on their own, while others worked in small groups. After the first day, the representations were of poor quality. The teachers wanted to find ways to help the children slow down and produce higher-quality work. They encouraged the children to go back to their representations to see whether they could add any details. 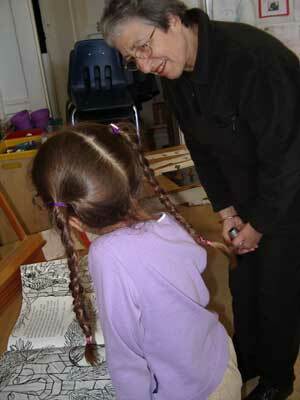 The children were encouraged to revisit their notes and the pictures of the visits. The children gave each other suggestions on what they could add to their work. Over the course of the week, the representations began to meet the expectations of the teachers, and the children were feeling proud of their work. Figure 30. A model of a tree losing its leaves. Figure 31. 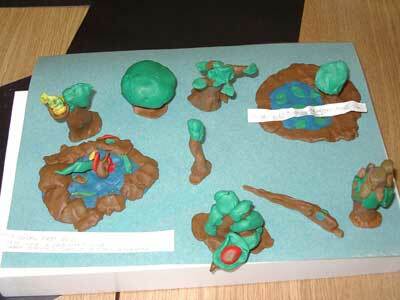 A model of the trees found in a tropical climate. Figure 32. Models of trees. Figure 33. Children made leaves for the tree. Figure 34. 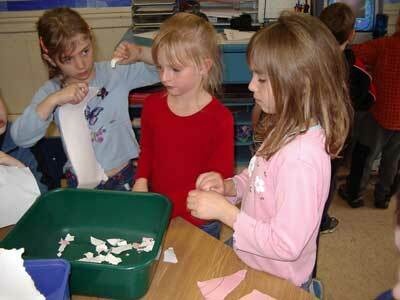 Children ripping paper to make recycled paper for their invitations. Wrapping up Phase 2 of the project, the teachers found that the children's representations were at various stages of completion. Some children needed to finish their representations, while others were ready to move on. Those who were finished were encouraged to write some facts about what they had created so that their work could be displayed. Some children went back to the list of questions to find out whether they had been answered. Other children began to plan a celebration. The children came up with a list of ideas for things that they wanted to do at their celebration. They decided who would do the jobs and planned the afternoon event. The children made invitations to their friends and family, and they practiced a song that they had learned about trees. They decorated the room and put their work on display. 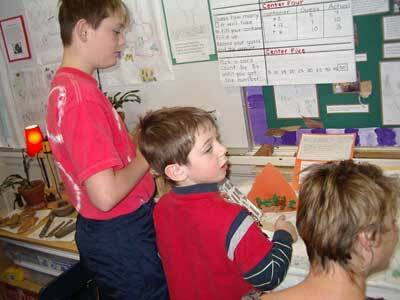 The children planned to have an open house at which their parents could come and look at the children's work. 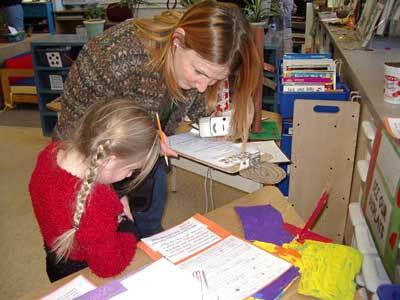 The children arranged their work on tables for their parents to see. The children also had a table for decorating cookies. They had learned that a slice of a tree is called a tree cookie. 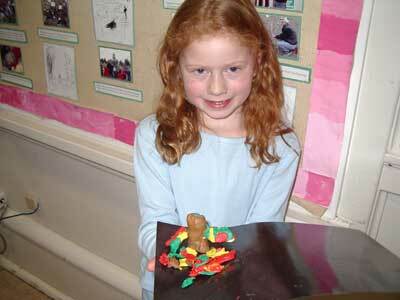 They liked the idea of having tree cookies that you could eat at their celebration. 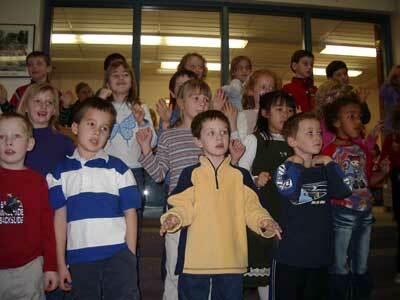 The children performed a song and a dance that they had created in gym about how trees change throughout the seasons. The parents played the children's games, asked questions, and were impressed by the knowledge the children had gained about trees. Figure 35. Playing a game about where trees are found. Figure 36. Reading the story "The Tall, Tall Tree." Figure 37. Singing Charlotte Diamond's song "What Kind of Tree Are You?" Figure 38. Child showing older brother and mother his model of trees. Figure 40. 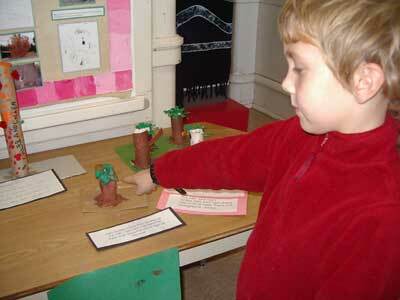 Child showing his model of a tree. Karen graduated from the University of Alberta, Faculty of Education, with a focus in special education. She began her teaching career in 1999, teaching students with severe disabilities. She then taught early education students with special needs for two years. She is currently teaching for the second year in a grade-one class at the Child Study Centre.